The Jingpos, numbering 132,143, live mostly in the Dehong Dai-Jingpo Autonomous Prefecture, Yunnan Province, together with the De'ang, Lisu, Achang and Han peoples. A few of them are found in the Nujiang Lisu Autonomous Prefecture. 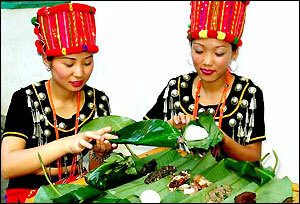 The Jingpos mainly inhabit tree-covered mountainous areas some 1,500 meters above sea level, where the climate is warm. Countless snaking mountain paths connect Jingpo villages, which usually consist of two-story bamboo houses hidden in dense forests and bamboo groves. The area abounds in rare woods and medicinal herbs. Among cash crops are rubber, tung oil, tea, coffee, shellac and silk cotton. The area's main mineral resources are iron, copper, lead, coal, gold, silver and precious stones. Tigers, leopards, bears, pythons, pheasants and parrots live in the region's forests. The Jingpos speak a language belonging to the Tibetan-Myanmese family of the Chinese-Tibetan language system. Until 70 years ago, when an alphabetic system of writing based on Latin letters was introduced, the Jingpos kept records by notching wood or tying knots. Calculation was done by counting beans. The new system of writing was not widely used, however. After 1949, with the help of the government, the Jingpo people have started publishing newspapers, periodicals and books in their own language. According to local legends and historical records, Jingpo ancestors in ancient times inhabited the southern part of the Xikang-Tibetan Plateau. They gradually migrated south to the northwestern part of Yunnan, west of the Nujiang River. The local people, together with the newly-arrived Jingpos, were called "Xunchuanman," who lived mainly on hunting. During the Yuan Dynasty (1271-1368), the imperial court set up a provincial administrative office in Yunnan, which had the Xunchuan area under its jurisdiction. As production developed, various Jingpo groups gradually merged into two big tribal alliances – Chashan and Lima. They were headed by hereditary nobles called "shanguan." Freemen and slaves formed another two classes. Deprived of any personal freedom, the slaves bore the surname of their masters and did forced labor. During the early 15th century, the Ming Dynasty (1368-1644), which instituted a system of appointing local hereditary headmen in national minority areas, set up two area administrative offices and appointed Jingpo nobles as administrators. In the Qing Dynasty (1644-1911), the area inhabited by Jingpos was under the jurisdiction of prefectural and county offices set up by the Qing court. Beginning from the 16th century, large numbers of Jingpo people moved to the Dehong area. Under the influence of the Hans and Dais, who had advanced production skills and practiced a feudal economy, Jingpos began to use iron tools including the plough, and later learned to grow rice in paddy fields. This learning process was accompanied by raised productivity and a transition toward feudalism. Slaves revolted or ran away. All these factors brought the slave system to a quick end in the middle of last century. The basic unit of Jingpo society was the small family of husband and wife. Some "shanguans" and rich peasants practiced polygamy. The family was headed by the father. A family with only daughters might have a son-in-law to live with it, but the son-in-law did not change his surname and his children would take his surname instead of that of his father-in-law. A childless family could adopt a son, who was required to support his foster parents and had the right to inherit their property. Elderly people without children were usually looked after by their relatives. The Jingpo family retained the system of inheritance by the youngest son. While the eldest son would set up a separate family after marriage, the youngest son would remain to support his parents and inherit most of their property. The youngest son had a definitely higher status than his brothers. Women had a low status in Jingpo society. The Jingpos practiced a hierarchical intermarriage system, that is, intermarriage between "shanguan" families and between common peasant households. While young people could freely socialize, their marriage, often involving many betrothal gifts, was arranged by their parents. Bride snatching was a common occurrence. When people died they were buried in the ground except for those who died an unnatural death. They were without exception cremated and their ashes buried. Jingpo people lived in thatched cottages of bamboo and wood except a few "shanguans" and headmen, who had houses of brick and tile. The cottages, oblong in shape, had two storys. The lower floor, about one meter above the ground, is for keeping animals, while the upper floor, usually partitioned into four to ten rooms with bamboo walls, is the living quarters for family members. In the middle of every room is a fireplace, around which people sleep. Every seven or eight years, cottages have to be rebuilt. Rebuilding, having the help of all villagers, is completed in several days. In 1950, liberation came to the Jingpo area. The Dehong Dai-Jingpo Autonomous Region was established in 1953 (changed to an autonomous prefecture in 1956). The Jingpo people elected their own representatives to the leading bodies of the autonomous region. In addition, the Jingpos have deputies to the Provincial People's Congress and National People's Congress. To fundamentally change the backward conditions in Jingpo areas, the central and local governments helped the Jingpos get organized for cooperative production shortly after liberation. Measures were taken to do away with class exploitation and vestiges of primitiveness. Since 1950, the Jingpo people have transformed virgin forests into tea plantations and orchards, and reclaimed barren mountain slopes into terraced fields. They have built tractor stations, reservoirs and power stations. Their grain production and income from sideline occupations have increased. Industry, which was nonexistent in Jingpo areas before liberation, also has developed. The autonomous prefecture has built a number of small and medium-sized enterprises including a power plant, a motor factory, a farm tools factory and a factory producing daily-use chemicals. There has been progress in other respects. Highways have been built on the formerly inaccessible Jingpo Mountain. High-tension power lines extend to many places, while a wire-broadcasting network covers almost every Jingpo household. Brick houses have begun to replace thatched cottages. Formerly poor peasants now have enough grain and different clothes for different seasons. Some more affluent peasants have bought radios, sewing machines and new hunting rifles. An increasing number of small hydroelectric stations have made electricity available to many Jingpo villages. The ruling classes before 1949 established no schools for the Jingpo people, resulting that very few people were literate. Now, however, there are middle schools in every county and primary schools in every community. Central and local ethnic minority institutes have trained group after group of Jingpo officials and professionals. Violent epidemics, especially malaria, used to ravage the area. Since 1950, clinics have been set up in key Jingpo communities and many medical workers of Jingpo origin have been trained. Efforts have been made to improve environmental hygiene and drinking water. There has been a marked decrease in disease incidence. Formerly rampant epidemics such as cholera and the plague have been stamped out, and malaria, the most serious threat to local people's health, brought under control. The once desolate Jingpo Mountain is beginning to enjoy a prosperity it has never known before. Rice is the staple food, although maize is more important in some places. Vegetables, beans, potatoes and yams are grown in cottage gardens. Jingpos also gather wild herbs and fruit as supplementary food. Jingpo men usually wear black jackets with buttons down the front and short and loose trousers. Elderly people have a pigtail tied on top of their head and covered with a black turban. Young people prefer white turbans. Jingpo men going out invariably wear long knives on their waist or take rifles with them. All carry elaborately-embroidered bags containing items such as areca and tobacco. Jingpo women usually wear black jackets with buttons down the front middle or front left. Matching the jacket is a colorful knitted skirt and a woolen shinguard. Women like wearing silver ornaments. Jingpos are good singers and dancers. Group dancing, their major dancing form, reflects their life, work, war and sacrificial rites. It sometimes involves more than 1,000 people, their singing reverberating in nearby mountain valleys. Jingpo musicians use wooden drums, "elephant-leg" drums, gongs, cymbals and bamboo flutes. Jingpos used to practice fetishism, believing that spirits live in the sun, moon, birds, animals, boulders and trees, bringing fortune or misfortune to human beings. As a result, superstition dominates their lives and taboos abound. Sacrificial rites accompanied sowing, harvesting, disease, weddings, funerals and combat.